If your cleaning company doesn’t have any set guidelines for proper, professional cleaning staff and janitor behavior, it can lead to some big headaches. All cleaning crew staff must have passed a multi-state background check. In addition to employment verification, credit history & drivers license check, we also complete a multi-state Criminal Background Check before hiring on any new Cleaning Technician. We love kids and family… but the job site isn’t the place for them! Children, relatives and other people are prohibited from access to the building, only the Cleaning Techs assigned to that building are allowed on the property. Cleaning Techs are trained in appropriate janitorial best practices that include a 90 day, 5 point training program. At AQC we weed through the muck to find only the best candidates and invest in them for our customers. AQC Cleaning Techs are required to complete & pass (w/80% or higher) a 90 day, 5 Point Training & Certification program that includes 1) Janitorial Best Practices, 2) In-Field Training, 3) Safety, Security & Confidentiality, and 4) Cleaning Procedures. A clear check in/out system should be established with permission to use phones for check in/out at each facility. At AQC, as leaders in our industry, we use an automated timekeeping system. Breakage of any customer property/equipment must be photographed and reported immediately. We take our job very seriously here… AQC has a 4 Step process that each Cleaning Tech is required to complete when reporting any breakage or lost items that include sending in pictures to document, date & time stamp accordingly. Staff are adequately supervised by a competent management team member. AQC ensures our Cleaning Techs receive routine, in-field supervision by Management in a team-like atmosphere. We inspect what we expect! Our quality control program consists of routine inspections completed every 4-6 weeks for each customer & inspections are reviewed same day directly with Main Cleaning Techs & Back-up Cleaning Techs. Our policy is that if 2 or more inspections fail (w/ less than 80% scoring) then the entire team will be required to re-enter their training program. All equipment should be clean and functioning correctly, and labeled as AQC property. AQC Cleaning Techs complete a 1x month equipment inspection to ensure the all Cleaning Equipment is in good working order, meets regulations & is properly labelled. It benefits our customers knowing that our mop buckets or roll carts will not be banging into their walls from broken casters or that our vacuums have bumpers as to not cause costly damage to walls. Mops, rags, etc. must be clean and laundered with dirties bagged in a separate area. We have a routine laundering system for our microfiber cloths, mop heads & dust mop heads that are monitored closely to ensure the cleanliness of our facilities. Our Cleaning Techs are Certified in WHMIS & HazCom for chemical safety to ensure our Cleaning products are used & labelled properly, and safety SDS sheets are accessible at all times. Our Cleaning Techs are considered professionals in their industry and want to be treated with respect. You will never see an AQC Tech eating leftovers, taking candy from a shared candy dish, using your fax machine/ copier, or changing the station on your radio. If your current cleaning company is not meeting these standards, you need to work with a company that does… Give AQC a call today to schedule your free estimate – you’ll be happy you did! 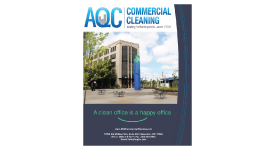 AQC is a full-service commercial cleaning company serving the greater west-side and Portland metro area since 1994. Our services include routine janitorial, floor care and maintenance, upholstery and carpet cleaning, window cleaning, and pressure washing including graffiti removal and much more. AQC is trained and quipped to service any size building or facility from under 5,000 to over 200,000 square feet, with ease and precision.